Choosing your paella pan may involve many factors. 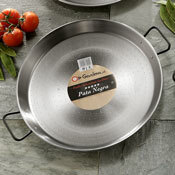 Maybe you want a traditional paella pan. You may be looking for a specific serving size. Then, you must also factor in what heat source you are going to use. To make life a little easier for you, we have put together a few helpful tips to allow you to find the perfect paella pan! Knowing the measurement of your ideal paella pan is crucial. One serving is an approximation based on about 1 1/2 cups of cooked paella per serving if you fill the pan up about 3/4 of the way. This would be an average serving, for a larger entree size portion, you'll want to estimate 1-2 servings per guest. Filling the pan to the top when cooking will allow for a few more servings, but traditionally paella is cooked in a thin (and crispy) layer at the bottom of the pan. Be sure there is enough room for the rice to expand, this will ensure all of the other ingredients cook evenly without overflowing. 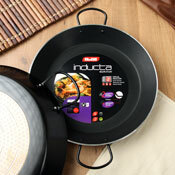 Specific care depends on the type of paella pan that you have. 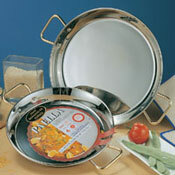 You may choose Stainless Steel and Aluminum paella pans are dishwasher safe and won't rust. Other choices include Traditional Polished Steel and Pata Negra paella pans which are the authentic type; however because they are raw steel, they will rust and should be washed by hand. Paella can be cooked on a number of heating devices. Traditionally, paella is cooked outside, over an open fire. However, due to inclement weather and other restrictions, many have opted to cook their paella indoors. 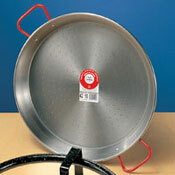 Holding on to tradition, we recommend our propane paella burners. For a heat source, we recommend one of our paella burners, a professional gas range, or cooking outside on the BBQ.